In 1758, the first Magdalen Hospital for ‘penitent prostitutes’ was set up in London. It was founded as a ‘humane scheme devised for the relief of those pitiable sufferers; for their rescue from calamities’. Admissions were once a month and women could not be pregnant or have any diseases. Upon entry, their street clothes were taken away and they were issued with a ‘uniform’, including a ‘grey shalloon [woollen] dress’. The woman in this frontispiece is an example of how the ‘inmates’ of the hospital looked. The Hospital was closely associated with the Church, as is intimated by the appearance of the chapel in the background of this image. 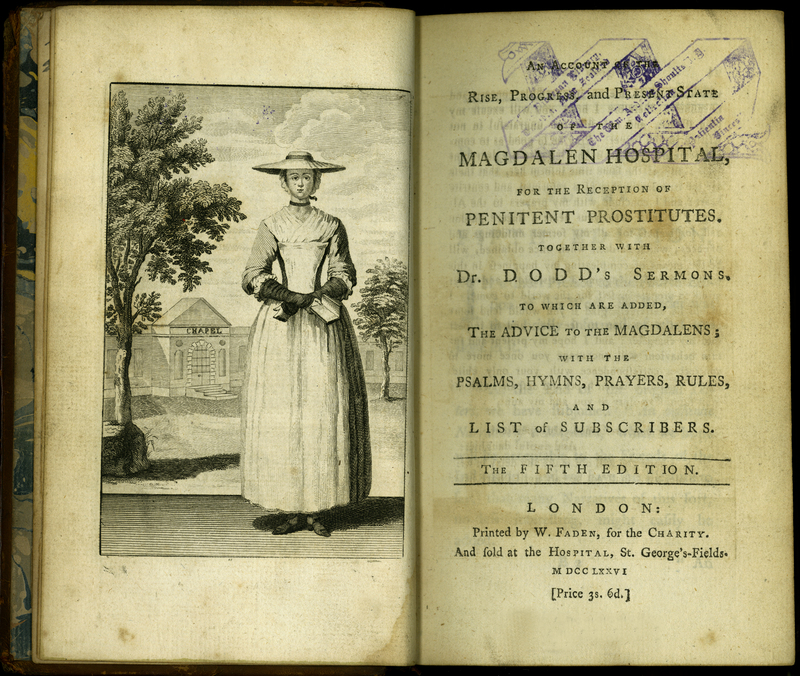 [William Dodd], “An Account of the Rise, Progress, and Present State of the Magdalen Hospital, for the Reception of Penitent Prostitutes. 5th edition,” ourheritage.ac.nz | OUR Heritage, accessed April 26, 2019, http://ourheritage.ac.nz/items/show/10711.